Tsum valley trek lies in 100 Km northwest from Kathmandu in lap of Manaslu Himal. Trek to Tsum valley is a revered Pilgrimage destination, especially for Buddhist. 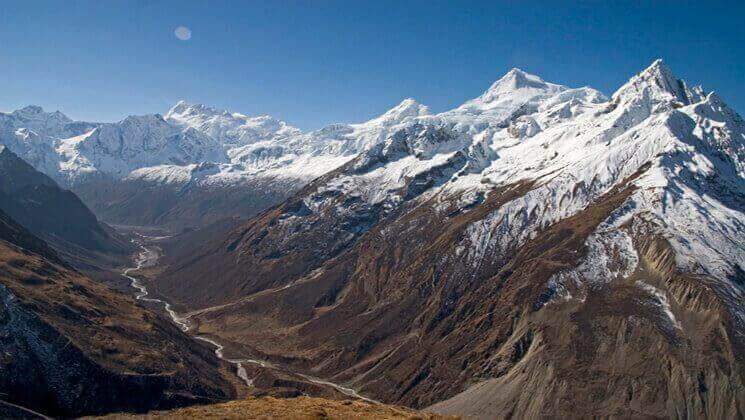 Since the Ganesh Himal and Sringi Himal, and Boudha Ranges are backdrop beauties of this serene valley, Tsum valley creates world’s one of the few untouched and isolated natural beauties. Moreover, Tsum valley trek offers an opportunity to explore the beautiful mountains such as Shringi (7,187m), Ngadi Chuli (7,871m), Buddha Himal, Himal Chuli (7,893m), Annapurna range, Ganesh Himal, rich in biodiversity and flora and fauna as well as ancient art – culture. During the journey, mu Gomba, Gumba lungdang are top famous places for side trips. Furthermore, trek to Tsum traverses the through Manaslu Region has rock-strewn trails with artistic chortens and the long line of Buddhist mani walls carved with paintings of deities and inscribed with prayers in their myriads of stone slabs. As the Tsum valley trek has tough geographical conditions, there has been very less development so you can still explore the unique cultures centuries old. This trek is possible to do in any time throughout the year. Hike to Tsum valley is a classical trek with 13 days itinerary compared to most walks in this region. The particular route is designed for world travelers who wish to hike in this trek with relaxing manner itinerary however if you are planning with limited time wise than take a look this special itinerary on Around Manaslu short trek – 13 Days. Day 2 Kathmandu city tour – World heritage sites seeing, 7 hours !. All aspects of gear and conditions are discussed to make sure you’re fully prepared for the trip. After lunch, we explore this medieval capital. We visit Boudhanath, also known as Little Tibet. We visit Pashupatinath, holy temple of Hindu where cremation takes place by the holy river Bagmati. Later we visit Kathmandu Durbar Square and Syambhunath Stupa. Return to hotel. Your trekking staff will come to your Hotel early in the morning at 7.00 am to pick you up; from there we have an 8 hour driving journey to Arughat. From Kathmandu to Dhading Bensi for 3.30 hours is comfortable drive but from there to Arugat for another 4 hours we will be driving on dirty road. Stay overnight at guest house. Day 4 Trek to Soti Khola (775m / 2,534 ft), 6 hours. Follow the Budhi Gandaki River toward its point of origin. We pass the village of Morder and Simre to reach Arkhat River. After Arkhat we ascend slowly toward Kyoropani. Camp today nears the confluence of Seti River – an ideal place to take a fresh water bath. Stay overnight at guest house. Day 5Trek to Machha Khola (900m / 2,943 ft), 5.30 hours. The trail descends slowly until you climb again to mountain ridge to Almara. Pass the forest trail to arrive at Riden Gaon. The valley here cuts into another side of the river to enter Budhi Gandaki. At Labubesi, the trail follows down to the sandy river bed of Budhi Gandaki. Camp tonight at Machha River. Stay overnight at guest house. Day 6Trek to Jagat (1,340m / 4,382 ft), 6 hours. After crossing Machha River and Khrola besi, there is a hot spring called “Tatopani”. The trail follows forested area after this toward Dovan. Below Dovan, there is a huge rapid at Budhi Gandaki. As the elevation increases, the rapids and the scenery undergoes a complete transformation. At Jagat, there is a police check-post where your trekking permit will be checked. Stay overnight at guest house..
From Jagat, after descending a long series of stone steps back down to the river, we then climb on wonderful stone steps along a terraced hillside to the small hamlet of Saguleri and Sirdibas, from where we can see the impressive Sringi Himal (7187m). We pass through the charming, villages during the day. Our route continues upstream, and again a steep climb to reach Philim. Philim is nice place to take lunch. Then there are two trails where one crosses a bridge and heads for Manaslu and the trail for Tsum valley heads right and then ascends for a couple of hours to Lokpa (2260m). Stay overnight at lodge. Today, the trek is easy. Our lunch and stay place is the same place. We take the trail heads down for half an hour before it then ascends steeply up. We then have a half hour descent to the riverside and cross the beautiful wooden bridge, before the final ascent of up to an hour to Chumling. They have a primary level school, a small clinic, with great views of the Ganesh Himal range. We are in the area where they import goods from Tibet. Day 9Trek to Rachen Bompa (3,300m / 10,791 ft), 6 hours. This is a tough and long day of walking but the scenic views of the valley amply compensates for the long walk. Chhokangparo is located at an altitude of 3010m above sea level is situated on flat land and consists of 2 settlements, Chhokang and Paro. From here you can get superb views of the Ganesh Himal range. Some households practice polyandry down here. This area is prominent for its Tibetan Buddhist heritage. Stay overnight in the guest house of Rachen Gumpa. Nile located at an altitude of 3361m above sea level is the last village heading north in the upper Tsum valley. This village is situated on the banks of the Shiar Khola and it consists of a large number of households. Mu Gompa is home to a very old monastery and there are no village establishments here. It is located at the highest and farthest point in the Tsum valley. This trail is used to import and export things to and from Tibet. You may come across several yak trains supplying goods to local villages. Stay overnight in the guest house of Mu Gumpa. Day 11Exploration day on Mu Gomba. Today we can take excursions to the many snow-covered peaks in the area for the most spectacular views of this trek. Take a Half day walk to the Nunnery and to a small pond a bit further up to Nunnery. Or day a full day hike to Vajyo with your packed lunch as there are no places to buy our lunch. Stay overnight in the guest house in Mu. Gumpa. Day 12Trek to Rainjam (2,600m / 8,528 ft.) via Chhule (3,347m / 10,945 ft), 7 hours. On an entirely descending path. This day you can enjoy glimpses of the Punchen Himal that is unique in shape. This day you continue your descent by retracing the path from your ascent. Stay overnight in the Guest house. On the way you can enjoy views of Manaslu and Ganesh Himal. Gomba Lungdang is home to a beautiful and large monastery that houses monks (all females). Men are not permitted in some areas of this monastery., the most spectacular sunrise through Ganesh Himal range is a magic moment. Stay overnight in Lodge. Day 14Descend to Ripchet village, 6 hours. After Breakfast at Gumpa, we take downhill keep our unforgettable and very close views of Ganesh Himal range to Rainjam and then gradual up and downhill to Ripchet, Ripchet is a big village where there are about 70 families living, its one of the most laid-back village in this region, You can find very simple lodges. Stay overnight at Ripchet. Day 15Trek descend to Lokpa (2,240m / 7,325 ft), 6 hours. Trail heads all the way down to Chumling village and then onto Lokpa. You will feel great here having been to higher altitude. Lokpa a small place where there is just one lodge, but they also have nice camping places. Day 16Lokpa to Dobhan (1,070m / 3,510 ft), 7 hours. After a short walk from Lokpa, we meet the trail of the Manaslu circuit trekking. Then we trek down to Ekle Bhatti and walk along the bank of the Budhi Gandaki River. Beside the trail, you can see the green fields and subtropical vegetation. After check out from MCAP counter, you reach to Philim, then to Sridibas and Salleri. The trail is stone paved and wide. We cross Jagat and again cross the suspension bridge to reach Yaruphant. If you feel tired and want to rest, you can stay around here or still walk to Dobhan and take a rest. Overnight at tented camp. Day 17 Trek descend to Soti Khola (700m), 8 hours. Right at the beginning, we cross the suspension bridge and follow the rocky ravine. An interesting fact, today is the natural hot spring. It is also a great cure for various skin diseases. Then we trek down to Khorlabesi and Machha Khola. The northeast view of the Ganesh Himal can be seen. The greenery of the fields and forests beside the Budhi Gandaki River is outstanding. We have a long walk today to reach the Soti Khola, which is the last day of our trek. Day 18Drive from Soti Khola to Kathmandu, 8 hours. A long day drive to reach Kathmandu. During the Bus/jeep drive, you can pass Dhading Bensi (District headquarters of Dhading). The road completely blacktopped, than join the Prithvi Highway. Along the drive, you can see numerous mountains and beautiful villages. Transfer to the hotel in Kathmandu and rest. How much does the Tsum valley trek cost? This trip is available now on USD 1,250 per person is standard trek price on double occupancy basis. But of course, the trip price will vary according to group size. For the deluxe and luxury Tent style trekking tour plan, 3-star category hotel deluxe air-conditioned room in Kathmandu (BB PLAN) with attached bathroom while trekking on possible places. AND WE ARE OPEN TO CUSTOMIZE YOUR TOUR AND PACKAGES PRICE AS PER YOUR REQUIREMENTS. International tour leaders are highly encouraged to get discount and attractive complimentary. Annapurna Conservation Area permits and Manaslu conservation permits and their fees. World heritage sites seeing transfer by private vehicle. We can organize private Tsum valley trek or tsum valley trek starting at any date that works for you. Please contact us for more information. Question: Do I need experience to do Tsum valley trek? Question: What kind of accommodation can I expect on Tsum valley trek? Answer: We provide you tourist standard accommodation in Kathmandu. But the rooms in tsum valley are very basic. Each room they fixed bed with mattress and blankets. However we recommend you to take your own sleeping bags if you have one with you otherwise, you may rent it while you are in Kathmandu. Question: What opportunities will I have for a shower along Tsum valley trek? Question: How do I get drinking water on lodge Tsum valley trek? Answer: You can buy bottled mineral water to drink but we advise against buying mineral water in plastic bottles, as currently there are no provisions for disposing of these. Instead, we provide you with boiled water or bringing chlorine tablets to purify the normal water as the normal water is available in campsite/along the way. Question: Is there any communication facilities on express Tsum valley trek? Question: Who will carry my luggage on Tsum valley trek? Manaslu Tsum valley offers picturesque villages, turbulent river gorges with nice waterfalls. This valley has unique cultural blend of Tibetan, less tourist, Nepali people, and their life styles. Fantastic views of Mt. Manasalu, Mt. Himchuli, Mt. Ganesh and others, Larkya la pass (5153m). Tsum valley trek Note ! Opportunities for challenging trekking or hiking and pleasant strolls are scattered all over this planet; you just need to know where to find them. We at Gokyo Treks and Expedition believe in the quality services. Your safety and satisfaction is our concern. We are a team of professional, experienced, well trained and licensed local guides who knows the destination much better than others. Not only this but also we give benefts the local communities and helps to conserve natural resources which reduced in costs and consumption. This time we made the Manaslu with Tsum valley, we have booked the necessary guide and porters at Gokyo Treks and Expedition. From the beginning there was an excellent communication with Ammar, the director, and everything was set up within a few days.